Optimized MediaShare Hosting For Media Sharing Communities. We'll register a new domain or transfer your existing domain free of charge with all MediaShare hosting plans. Switching to us is easy! We'll move your entire MediaShare website from your current host hassle free. Host unlimited individual websites on all of our hosting plans. Install multiple instances of MediaShare with ease. FFmpeg video and audio conversion modules come pre-installed so you can setup your MediaShare video website without having to install any codecs. Our CSF firewall will protect your MediaShare website from login attempts and other malicious activity. We host thousands of MediaShare websites and can help you navigate MediaShare if you need a hand. We're sure you'll love our MediaShare optimized hosting but just in case we'll give you a full refund within 30 days. Build And Launch Your MediaShare Website With Us Today! We Host Thousands Of MediaShare Websites With Hosting Plans Literally Built For MediaShare. 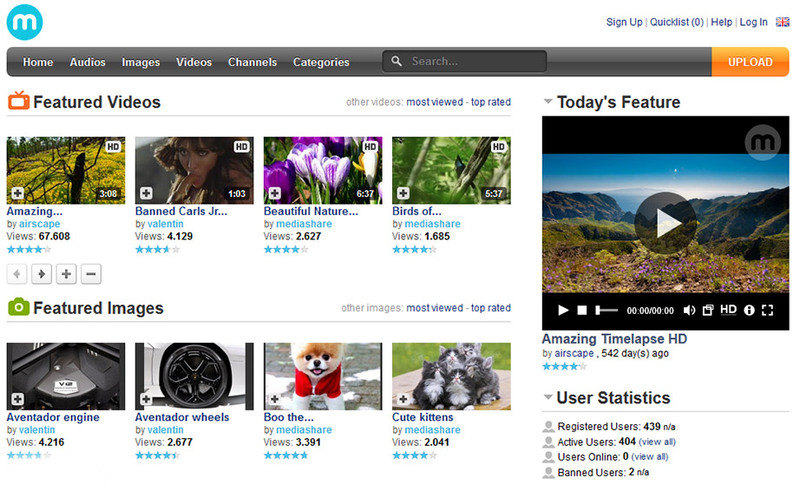 MediaShare is the best way to create your own video, audio and picture sharing community website. MediaShare is a paid script that works perfectly with HostUpon's MediaShare optimized hosting plans. How do I install MediaShare? MediaShare offers a free installation if you purchase hosting from us. Simply contact them once you've ordered a hosting plan and they will install their script on our servers for free. Can I upgrade between MediaShare Hosting plans? Yes, you can switch between hosting plans at any time and our prices are pro-rated meaning you simply pay the difference of the new plan. Upgrades are instant between MediaShare hosting plans and there is no downtime. Can you help me install my MediaShare script? Yes, for a small one-time fee we can setup, configure and install your MediaShare Theme. Simply submit a support ticket and our techs will explain the process. Which hosting plan do you recommend? For media heavy websites that will be converting video and audio streaming we highly recommend the Premium Unlimited plan. Video conversions use a lot of CPU and memory and you'll get the best performance on the Premium Unlimited plan which is optimized for MediaShare. "I chose HostUpon for my video site and I absolutely love it. The customer service is wonderful, they helped me from the very get go in setting up my MediaShare script and making sure I completely understood everything that needed to be done. They made it really easy to host my first video site and walked me step by step in doing it, and I couldn't be happier with the overall experience."